Apple recently informed The Verge's Nilay Patel of the added support, saying Logitech's device will work with the latest iPad Pro models released late last year. "They told me that when the next version of iOS 12 comes out, presumably next week to support the streaming service, the Logitech Crayon will work with the iPad Pros," Patel said during an episode of the Vergecast podcast. "I don't know who's buying a $1,500 iPad Pro and a Logitech Crayon." Whether Crayon will also offer support for first-generation iPad Pro models is unclear, but AppleInsider has confirmed the stylus does not work with a 2017 12.9-inch iPad Pro running Apple's most recent iOS 12.2 beta. Support for iPad Pro would make Crayon the only feature-rich stylus compatible with Apple's contemporary slate lineup. Apple confirmed Crayon support for the third-generation iPad Air and fifth-generation iPad mini earlier this week. Apple's own second-generation Apple Pencil incorporates features not supported by 2018 iPad Pro models, not the least of which being a switch from Lightning to inductive charging. Unlike the first-generation Apple Pencil, which plugs into an iPad's Lightning port to charge, Crayon sports a female Lightning receptacle, meaning it can be juiced up with a basic Lightning cable. 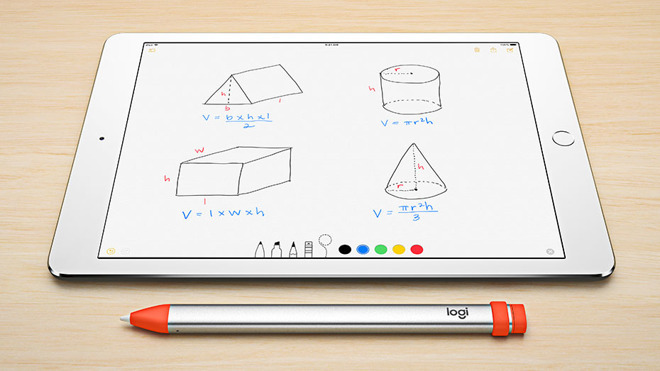 Logitech's Crayon debuted alongside Apple's budget-minded 9.7-inch iPad in 2018 as an economical alternative to Apple Pencil. Positioned to serve the education market, Crayon sales were initially restricted to schools before wide availability six months later. Crayon boasts many of the same features as Apple Pencil, including easy connectivity, tilt sensitivity and palm rejection technology, but does not support pressure sensitive input and tap gestures. Apple is expected to release iOS 12.2 next week with integrations for a news subscription service anticipated for unveiling at a special event on Monday.